We are the newest ORTHODONTIST located in Cedar Park outside of Austin, Texas. Schedule Your Complimentary SmileOn Consultation. We only use the highest quality orthodontic materials including Carierre® self-ligating brackets, Wild Smiles® brackets, Invisalign® clear aligners and Harmony lingual braces. 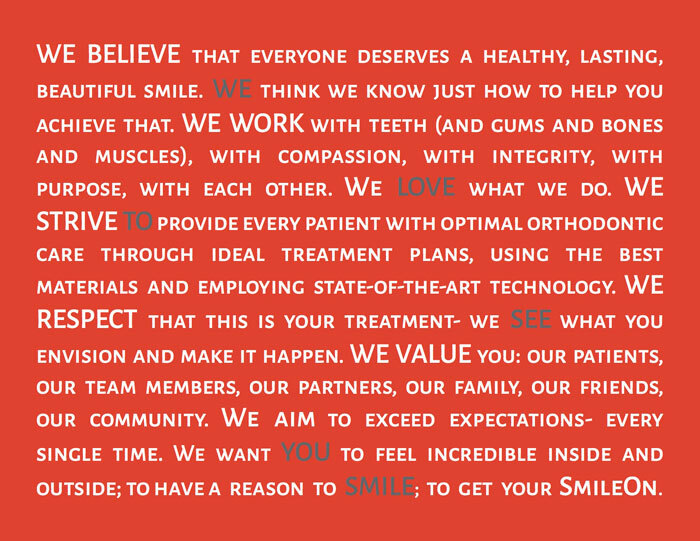 We believe that with better technology comes greater treatment efficiency, improved aesthetics, comfort, and results. We have put hundreds of hours of planning and research into our office to provide our patients with a welcoming, comfortable, clean environment. We are an all Mac-based, digital and (well almost) paperless office and pride ourselves on being environmentally responsible. We pride ourselves in being readily available for our patients and are here to serve you: day or night! Our appointment times are flexible: we are open early mornings before work and school and evenings and even making your orthodontic treatment as convenient as possible. What’s the point in trying to be the best you can be without sharing the love? Each season, we focus on an important issue, and pick a monthly charity to donate to. In the Spring (March- June) we . Some of the charities we donate to include With each new patient that begins treatment, we donate $100 to our monthly charity or a local school of the patient’s choice.